That site is what is today called, simply, Piazza Mercato —Market Square. It is still bounded on the east by the very prominent church of the Carmine (the above photo was taken from the belfry of that church) and, at the time (the mid-1200s), was almost directly on the sea. It became a thriving market place with easy access to shipping and became the site of many historic episodes in the history of the city. The first of these was the execution by beheading of the young "Corradino" (technically, Conrad V of the Holy Roman Empire), the last Hohenstaufen pretender and the last potential threat to Angevin rule on the southern Italian mainland; that happened in 1268. Much later, it was also the site of the outbreak of Masaniello’s Revolt (1647). In short, Piazza Mercato was a bustling market place of a large medieval city—busy, loud, colorful and grimly violent at times, a place where you could buy fish and then maybe watch a hanging or two. 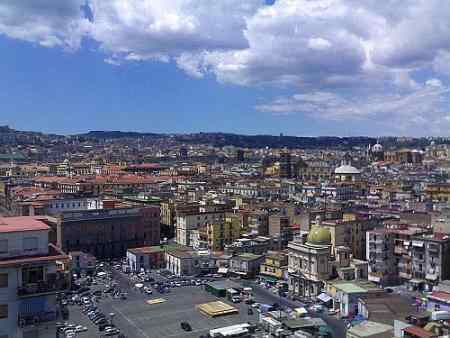 It remained the commercial center of Naples for centuries and did not start to fade until the great urban renewal known as the Risanamento came along in the late 1800s and cut the square off from the rest of the city. It really faded in WWII since it was adjacent to the military port and near enough to the train station to sustain heavy damage from Allied air raids. In site of recent building in the area, Piazza Mercato is still a seedy place and not at all a tourist attraction. 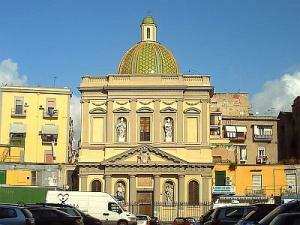 I don’t know if there is much hope for a total cleaning up of the entire square, but if there is one church in Naples that should be restored and reopened, either as a place of worship or even a museum (given the intense history of the area), it is the church of Santa Croce e Purgatorio al Mercato (photo, right, and the building with the yellow majolica-tile dome in the lower right-hand quadrant of the top photo accompanying this article). It has history and lore connected to it that stand out even in a city strewn with remarkable reminders of the past. The original church was called the church of Santa Croce and was much smaller and in the center(!) of the square. It was erected in the mid-1300s on the spot where the execution of Corradino had taken place in the previous century and where a marble column had been placed to mark the event. In 1656, the plague swept through the city and the square was used as a mass grave for 47,000 victims. In 1774, a second small adjacent church was erected, also near the center—the church of Purgatorio al Mercato—on the site of a cross that marked that mass burial site. A fire in 1781 destroyed both churches and many other ramshackle structures in the square, and a consolidated church was then built, still in the center of the square. That rebuilding plus the redesign of the entire square was done by architect Francesco Sicuro (1746-1826) whose other works in Naples include the Palazzo Salerno (on the southern side of Piazza Plebiscito) and the Teatro Fondo (now called Teatro Mercadante). In 1875, the church was moved from the center of the square to the location shown in the photo. In spite of some recent attention given to restoring the church, the results are less than satisfactory. The church was already showing structural problems before the 1980 earthquake, which caused its closure. Recent visits to the premises reveal the effects of decades of neglect and even vandalism. (It is one thing for the indigent to seek shelter in a closed, abandoned Christian church; that strikes me as a totally Christian use of the premises. It is quite another thing for idiots to spray-paint the interior and desecrate tombs by ripping them open and scattering the remains. That, too, has happened in the church.) In any event, the premises still contain historic artifacts such as the column that marked the execution spot of Corradino and even the executioner's blood-stained chopping block. (Or at least that's what locals used to tell you; kill-joy skeptics see a grimey old key-stone left over from when the church was moved to its current location. Me? I don't know. I also have no opinion on the lore that claims that a pool of clear, pure water formed and persisted at the base of the Corradino column in the center of the square or that it persists even today(!) at the location of the column within the church.) Significant art (including at least one work by Luca Giordano) within the church was removed after the closure to other premises for safe-keeping.